Once again the public toilets in the capital city Kathmandu have come into the limelight but all for the bad reasons. The city lacks public toilets according to the population density and still worse many existing toilets are in pitiable condition and lack basic facilities of a public toilet. No wonder many public toilets emit odious stench due to lack of regular cleaning and maintenance. It seems that the caretakers and authorities responsible for maintaining the public toilets are not doing their job properly despite charging high toilet fees from the users. The toilet operators do not care about the facilities and hygiene condition of the toilets. Similarly, it is the sheer negligence of the Kathmandu Metropolitan City (KMC) for not monitoring the operation of the public toilets. Therefore, the KMC should make its monitoring mechanism strong to ensure basic facilities and cleanliness in all the public toilets. In addition, the KMC should give priority to the construction of more hygienic public toilets in the city. And, for the toilet operators, they should realize their duties and pay proper attention for maintaining basic facilities and cleanliness in the toilets. Kathmandu: The taskforce formed to evict squatters residing alongside the Bagmati river banks has urged landless people to leave their settlements within four days or face a forceful eviction. According Mahesh Bahadur Basnet, coordinator of the taskforce, squatters have been notified of the decision through miking in the Thapathali area on Saturday. Kathmandu: Squatters living on the river banks in Kathmandu Valley have refused to participate in the process of verification of genuine landless families, dubbing the government´s move as "a conspiracy to classify them as bogus landless squatters". Samyukta Rashtriya Sukumbasi Morcha, a struggle committee formed by six different organizations of landless squatters to oppose the government´s move to evict them from the river banks, has refused to participate in the verification to be conducted by the Ministry of Physical Planning and Works. Kathmandu: Employees of Nepal Water Supply Corporation (NWSC) have staged agitation against the unjust dismissal of employees working on contract basis by the Minister for Physical Planning and Works Hridayesh Tripathy. The agitated employees have halted works and services of NWSC central office in Tripureswor. Kathmandu: Most of the public toilets operated by the Kathmandu Metropolitan City (KMC) are in pitiable condition. Open defecation and urination is on rise in the capital city owing to the lack of proper maintenance and cleanliness of public toilets. The KMC has not paid much heed towards the construction of new toilets despite the growing population in the city. Kathmandu: The banda called by squatters in the Kathmandu Valley on Tuesday fell flat as vehicles plied as usual giving two hoots about the strike. The strike was announced to protest the government plan to demolish settlements build encroaching public land alongside rivers in the Valley. More than 400 squatters were arrested from several places of Kathmandu, Lalitpur and Bhaktapur for disrupting vehicular movement. 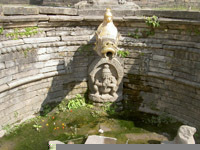 Kathmandu: Stonespouts in the urban area of the country are under the verge of extinction because of unmanaged urbanization and immediate initiation should be taken to protect them. This is the idea put on at an exhibition by some students of the engineering college in the capital. The exhibition kicked off from Friday. Kathmandu: The Kathmandu Metropolitan City (KMC)’s plan to facelift 11 ancient temples, stone spouts and traditional inns does not come to fruition even four years after its announcement. The KMC had allocated a budget to improve these structures of cultural importance in the fiscal year 2008/09. Although funds have been allocated in subsequent years for the purpose, nothing has happened, while the budget is frozen every year. Kathmandu: After getting a go-ahead nod from the government, the taskforce formed to implement the plan envisaging the eviction of squatters residing on the banks of the Bagmati River has decided to start its campaign from the UN Park. A meeting of the taskforce held at the District Administrative Office, Kathmandu, on Thursday decided to launch the drive from the third week of January to reclaim the park’s encroached land. 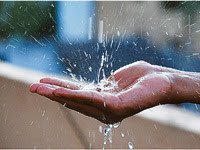 Kathmandu: 'National Water Week-2012’ is going to be celebrated from March 17 to 23 this year as in the past years. The United Nations (UN) has decided to celebrate the World Water Day this year with the slogan 'Water and food security'. In this connection, a meeting held on Thursday under the chairmanship of Secretary at the Secretariat of Water and Energy Commission, Bishwo Prakash Pandit has formed a 51-member-National Water Week-2012 Main Organising Committee under the chairmanship of Pandit himself. Kathmandu: The government will evict the squatters who have encroached on the land along the riverside in Kathmandu after identifying them in seven days. A meeting attended by Deputy Prime Minister and Home Minister Bijay Kumar Gachchhadar with various stakeholders - officials from environment ministry, land reforms ministry, physical planning ministry, secretaries from various ministries, officials from the Kathmandu Metropolitan City and chiefs of security agencies - took a decision to this effect. Kathmandu: The construction of Melamchi Water Treatment Plant at Sundarijal is likely to delay after the Japan International Cooperation Agency (JICA) expressed dissatisfaction towards the China Geo Engineering Corporation Company recommended by the Melamchi Water Supply Development Board for the construction of the treatment plant. Dhading: The dalit community residing across Maidi-3 Kotthok of Dhading district has collaborated to get water at their villages. As there is no water source near the village, the locals have to walk for an hour just to fetch a pot of water. The locals have united to offer voluntary labour for eradicating the menace of water shortage. Doti: A woman has died in Barla-6, Achham district while spending the night in chhaupadi, a shed located some distance from the house where menstruating women of the family have to sleep. Jhuma Devi Shahi, 40, was found dead in chhaupadi on Monday morning. “She was found dead with nasal bleeding when others went to see after she failed to wake up by nine in the morning,” said Ram Bahadur Shahi, a local. Rupandehi: The decision of the government to declare Rupandehi district as an area free from open defecation within 2017 can be accomplished by putting little effort from all groups. The above remarks were made at an interaction entitled ‘Diplomatic policies for sanitation and drinking water and national sanitation master plan; organized by District Drinking Water and sanitation Sub Division Office. This dry season, the consumers of Kathmandu Upatyaka Khanepani Limited (KUKL) are sure to get only 23 litres of water per day per person given rising power cuts and almost no increment in water sources in the past year. For the urban areas, an individual’s water need per day is 100 litres, something acknowledged as necessary and set as a target by the country’s Urban Water and Sanitation Policy. What has happened to the Melamchi water project that was supposed to supply abundant water to the Kathmandu valley? The difficulty in procuring potable water in Kathmandu is acute. What is stalling the BAP? In sewage management, as in other things, decentralization is a matter of debate. And lack of progress on the Bagmati Action Plan (BAP) reflects discrepant views on the matter among invested parties. The government launched the BAP last September in an effort to “restore and conserve the Bagmati River and its tributaries”, through “an integrated and coordinated approach”. When Vipul Lama bought a bottle of mineral water, little did he know that fungus and dirt particles would be floating in it. This has come as a warning for those who believe packaged water is totally safe. Vipul, a resident of Gwarko, decided not to compromise on his family's health, eschewing the unreliable possibly unhygienic water supplied through tankers for packaged drinking water. Kathmandu: Kathmandu not only boasts of being the Capital of the nation, but also is rich in terms of water resources — ponds, stone spouts and rivers. However, a bitter truth cannot be overlooked that these important sources of water are drying up, have dried or cannot be traced due to absence of conservation and reckless behaviour of the citizens here.